Pre-Draft Report: The Phillies plan in Latin America is simple; instead of making one big splash a year, invest a smaller amount of money across a number of guys and hope to get lucky. With the very high attrition rate for Latin American prospects (and prospects in general), it would seem this approach is the most prudent. The Phillies famously signed Carlos Ruiz for $8,000 out of Panama, and they may have found a similar bargain in Sebastian Valle, plucking him out of Mexico in 2006. He received almost no traction from Baseball America, failing to crack their Phillies top 30 list in 2007, 2008 or 2009. Career Synopsis: Valle got his start in pro ball in 2007 in the Dominican Summer League, as he logged 214 PA as a 16 year old. He showed solid numbers, with a 3 slash line of .284/.398/.403. The Phillies brought him stateside in 2007, and he made his US debut in the GCL as a 17 year old, posting a .281/.341/.407 line in 185 PA, showing plenty of doubles power. The Phillies aggressively promoted him to Lakewood to start the 2009 season, where he spent some time as an 18 year old, and he predictably struggled, hitting just .223/.313/.331 in 179 PA. Though the overall line doesn’t look pretty, he still drew his share of walks, even though he didn’t hit for power. After a demotion to the NYPL, where he was still one of the younger players in the league, he rebounded with a .307/.335/.531 line, trading walks for an impressive power display, in a notorious pitcher friendly league. Baseball America ranked Valle #7 in the Phillies organization heading into 2010 and #4 in the NYPL for the 2009 season. The Phillies weren’t shy about sending Valle back to Lakewood, and he’s responded in 2010 so far by posting a .252/.295/.432 line. While the walks haven’t been there, he has shown very good power, especially for the position, with 25 2B and 16 HR in 453 PA. His approach will need work, but he has the raw power and line drive swing to be an offensive asset. His biggest strength is his age, as he just turned 20 in July. His defense has been the big question mark, and while he is still raw, his 33% caught stealing rate in 2010 is a career best, and though he has 12 passed balls in 2010, this is a decrease (rate wise) over his 2009 performance, where he committed 11 passed balls in far fewer chances. Valle started 2012 in Reading and received a midseason promotion to Lehigh Valley after the Phillies acquired Tommy Joseph. Valle showed good power hitting 17 HRs over the course of the season. But his plate discipline continued its downward spiral as he struck out 114 times and walked only 13 times over 401 plate appearance. His defense continued to be good. Baseball America rated him the #15 prospect in the system. Summary: Valle’s approach at the plate is a big issue, as he is allergic to taking walks and does not make contact at an elite level. He’s previously displayed power potential though it wasn’t present in 2011. The pitcher friendly Florida State League could have had something to do with that. Defensively, Valle has improved since signing and looks to be at least average defensively. 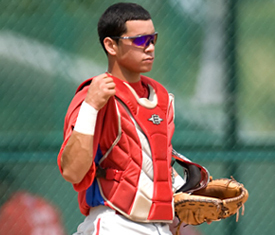 He has above average athleticism for a catcher, which should help him as he matures and approaches the big leagues. He has a shot at being a major league regular at the most important position on the diamond, which makes him valuable. Notice Valle’s setup. He has quite a bit of movement before the pitch is delivered, with a noticeable bat waggle, but he gets his hands set in a great position before the pitch arrives. He creates plenty of bat speed with his strong wrists, and his trigger, the leg kick, will help him generate more raw power. As I mentioned, the key will be the development of his batting eye, and laying off of poor pitches. As he is warming up the pitcher, you can see he provides a very quiet target for his pitcher, not moving around. This is one of the keys to helping your pitcher get close pitches, as a lot of extraneous movement by a catcher (a “noisy setup) can cause an umpire to flinch or miss a close pitch. Valle’s setup looks fine, and his arm is fine. Blocking pitches in the dirt, as well as the nuances of pitch calling and setting up batters will be the two areas he will have to spend the bulk of his time focusing on. When was this profile last updated? Is there a place on the profile that I’m missing that mentions the posting date? Good point, the profiles don’t have a posted date. I’ll work on adding “updated on” dates to the top of each profile. I think this one was originally written this past summer, and the Domonic Brown profile is also a bit older. But all of them have been written from summer 2010-recently. Profile updated to include the date last updated, as well as a summary of the tools grades. Question on Valle. I had popped over to Scouting the Sally earlier looking for stuff on Biddle. Didn’t find anything but I found last offseason’s review of Valle. It was fascinating to read the scouting report on him going into this season. Mike mentioned the very real power Valle was demonstrating, but that with an uppercut swing that required a lot of energy, he was likely a player who would never hit for a high average. He did mention that Valle’s upper cut was less pronounced in BP. Now fast forward a year and Valle spent most of the season hitting over .300 but with much less power. Have you seen any video or scouting reports to indicate that Valle has retooled his swing? Or is this something we can primarily chalk up to the effects of playing in Clearwater? Hi there to every single one, it’s really a good for me to visit this web page, it consists of helpful Information.